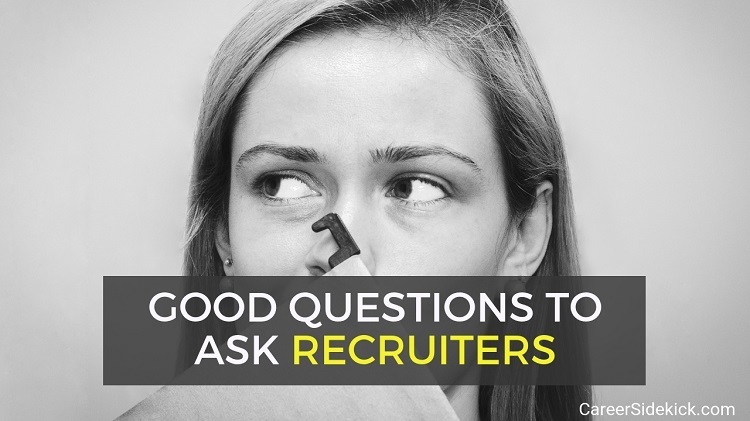 If you’re looking for questions to ask recruiters, you’ve come to the right place. After working as a recruiter for 6+ years, I’m going to share the 9 best questions to ask a recruiter in a first conversation. I’ll also give you my best tips on how to ask them about salary. Asking these questions will help you make a great first impression, but will also give you important information about the opportunity you’re discussing, and help you make sure the recruiter can be trusted! Question 1: How long has the position been open? This is a great question to ask recruiters because it will give you a sense of how the search has been going, how many candidates are in the company’s pipeline, etc. If a position has been open for a year, it’s tipping you off to the fact that the hiring manager is either extremely picky, or nobody wants the job. This is usually a red flag either way. It could also mean that the hiring manager doesn’t really know what he/she is looking for and keeps changing the requirements. At the same time if a position has only been open for one week, you can expect a delay in the hiring process even if you interview right away. Hiring managers usually like to see two or three candidates face to face before making an offer. Question 2: Is this position a backfill or newly created? It’s nice to know if a position was previously held by somebody else or if it was newly created within the organization, so this is one of the best questions to ask a recruiter. There’s no right or wrong answer to listen for here, but knowing this type of information is helpful in understanding the big picture. If this is a backfill, you can follow up by asking what happened to the person that previously held the job. Maybe they were promoted, left the company, transitioned into a new group, etc. Question 3: What can you tell me about the hiring manager? Not only will you interview with this person, but you also might report directly to them (it’s a good idea to ask specifically whether the hiring manager is also the person you’ll be reporting to). So it’s helpful to know what type of technical background the hiring manager has, as well as information about his/her history within the company. This information will be helpful when speaking with the hiring manager later in the interview process. Question 4: What are the 3 or 4 most important skills? This information should be used to assess whether or not the job will be a good fit for you. If you decide it’s potentially a good fit, use the information provided to customize a resume before sending it (if you haven’ t submitted a resume already). You should also use this information to prepare some talking points or questions before your interview. Question 5: What are some reasons that other candidates haven’t been selected? This is an essential question to ask recruiters because the hiring manager might not tell you this information later in the process. This can help identify some potential mistakes that candidates have exhibited, whether it’s on a resume or during an interview. This type of question is designed to find out how good they are at their job, and if you should trust them and work with them. These questions are especially important when working with an “agency recruiter” (a recruiter that helps multiple employers hire people, and doesn’t work directly for the company you’re trying to get a job at). Question 6: How long have you been recruiting in this industry? Listen to find out if they have substantial experience as a recruiter, and in this industry. Or are they new and relatively inexperienced (and therefore less knowledgeable and less likely to get you hired). Question 7: What is your relationship with the hiring manager? The best recruiters will have a direct line of communication with the hiring manager. They talk frequently and work closely together on the hiring process. This isn’t 100% required, and you’ll find some good recruiters out there that work more with a company’s HR department. It depends a bit on the type and level of job you’re pursuing, but this is still worth asking and finding out. Question 8: How often do you communicate with this hiring manager? This is similar to the question above. Asking recruiters this question will tell you even more information about how closely they work with this company, and therefore how much they can influence the process and help you get the job! You’ll want to listen for clues about how often, and how they communicate. For example, do they have the hiring manager on instant messenger? Or do they exchange one email per month and barely know each other? Question 9: What is your company’s relationship with the hiring company and how long has your firm worked with them? This will tell you more about whether the hiring company trusts this recruiter and is likely to hire from them. These are all questions you should ask a recruiter that works for a staffing or recruiting agency. You’ll learn a lot of key facts, and you’ll also get a sense of their personality and confidence based on how they answer. In the end, trust your gut and work with a few good recruiters that seem to enjoy their work and know it well. You don’t want to seem like you only care about salary in a first conversation, but you also don’t want to waste your time if the position would be a step down in pay, either. I’d never recommend asking that in a first conversation. One other good option is to offer them some information about your recent pay and see how they react. They might say “yes,” which is great… or they might say, “no” and save you some time. They might also say “no” but mention that there’s a more senior-level position that could pay better. Overall the choice is yours – you don’t NEED to tell them your salary, and a lot of people feel this is private info. But it’s just one option available to you, to help you quickly figure out if this job is worth pursuing. Even if you never seek out help from a recruiter, you might still find yourself interacting with them if they contact you, and that’s where knowing the best questions to ask recruiters can come in handy. If you ask recruiters these 9 questions, you’ll seem highly-prepared, you’ll learn information that you can use to give great interview answers when you talk to the hiring manager, and you’ll make sure the recruiter is someone you want to work with! Previous Post Interview Tips: 5 Basic Steps to Prepare for a Job Interview Next Post Does Your Resume Really Need an Objective?